This one's been in the works for quite some time. I started it off as a TF2 spray, but it grew into something rather more detailed. I enjoyed doing this one, but it's not quite as symmetrical as I'd have liked. 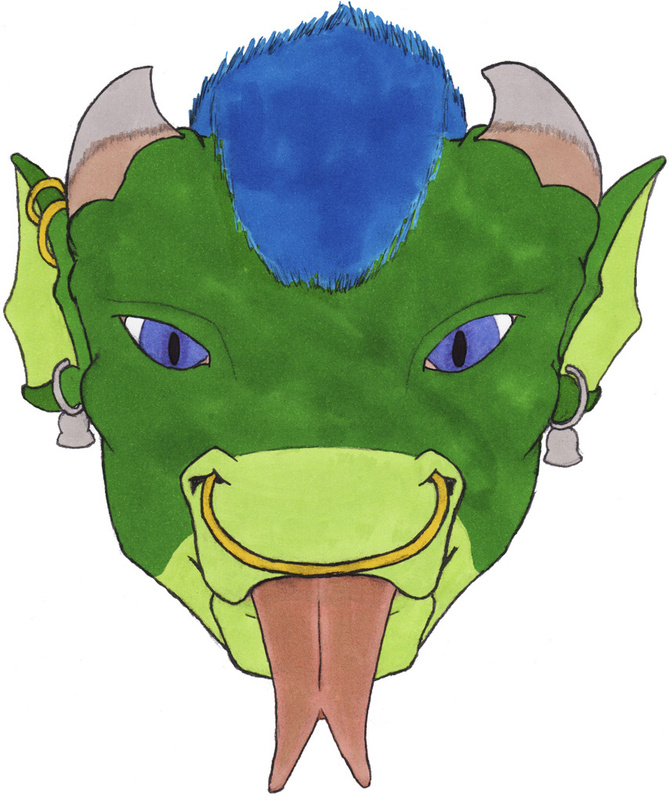 (Note the tips of the horns; the ears have muscles in them, and that's within the realm of a believable pose) On the other hand, both horns have been rounded off with a Dremel tool (more or less) since I started drawing this so I may just fix them in Photoshop. Those bell earrings arose in an RP session a decade ago, and have stuck around since then. The rest of the piercings are a lot newer. You can see a little bump tipped with a little scar at the base of the right ear by those earrings where his RFID biomonitor was injected. It provides cryptographically secure authentication, heart rate, blood pressure, blood pH, blood sugar, approximate core body temperature, alcohol content, toxin screening, and a good bit of other life-signs telemetry that might come in handy should he ever end up in an ambulance. The scar is likely to fade entirely, unless treated with a drug to deliberately encourage scarring; his other "cute little scars" are the result of bandages treated this way being used to cover closures made with surgical-glue. (hence the lack of a ladder effect down there) His wing-scars resulted when the removal sites were sprayed down with a solution of antibiotics, one of which has a similar effect on scar retention by inhibiting the stem cells that would replace scar tissue with normal skin.